Awad al-Qahtani and 16-year-old grey stud Cassander Van Het Bremhof clinched the Big Tour title on day two of the HH The Amir’s Sword Equestrian competition yesterday. Awad al-Qahtani threw down the gauntlet ahead of today’s feature event of the HH The Amir’s Sword equestrian championship, after he claimed the Big Tour victory yesterday. 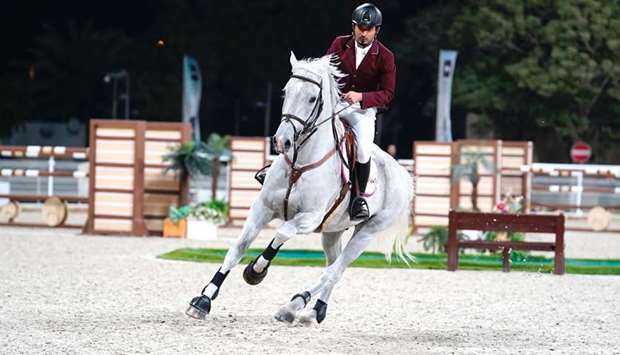 On the penultimate day of the Championship at the outdoor arena of Qatar Equestrian Federation, al-Qahtani was in fine form with his 16-year-old grey stud Cassander Van Het Bremhof to win the 140/150cm class. Day one winner Mubarak Yousuf al-Rumaihi this time had to settle for runner-up place with his champion horse Vivaldi K, with the pair coming home in 68.18secs, four seconds behind al-Qahtani and Cassander Van Het Bremhof. In third place was Faleh Suwead al-Ajami astride Carport, as the duo completed their round in 68.38secs. Today, the Big Tour Class will be the one to watch out for as the rider’s battle it out for the prestigious Amir Sword. The winner will also walk away with a brand new car. Today’s action will however begin with two dressage competitions at 10am before the action switches to the marquee event, Big Tour 140/150cm, one round against the clock for HH The Amir Sword at 2:30pm. The Small Tour will start at 4pm while the Medium Tour will kick off at 6pm. Earlier yesterday, French rider Cyrine Cherif was in sizzling form with her favourite mount the 12-year-old bay stud Gerlin VD Waterkant to win the Medium Tour class. Cherif, a regular at the Hathab national series, marshalled her horse superbly to top the 18-rider field in 66.65secs. Sultan Rashid al-Marri on Le Premier K came second in a time of 76.99secs, followed by Mohamed Khalifa al-Baker astride Arselina in 77.86secs. The Small Tour honours were shared by Abdulaziz Ghanim al-Nuaimi, who rode Jalieny Diamant Z, and Abdulla Rashid al-Amri on What A Lady Van de Smis both emerged flawless clocking exact 52.20secs. Al-Amri also claimed the third spot riding Cinderella and clocking 53.62secs. Future Riders competitions were also held yesterday, with Saoud Abdulla al-Kubaisi and Fahad Abdulkarim Abed winning the 85/100cm and 70/85cm class respectively. Al-Kubaisi rode Selest to victory, while Abed on his mount Kashmir was also faultless to win with ease. Al-Darwish also praised the joint effort between QEF and Al Shaqab to conduct the equestrian championships. He thanked Hamad bin Abdulrahman al-Attiyah, Chairman of the Joint Committee and the Executive Director of Al Shaqab, Khalifa bin Mohammed al-Attiyah and Omar bin Khalid al-Mannai, Vice-Chairman of the Joint Higher Committee and Ali bin Yousef al-Rumaihi. “We have worked for two years in the complementary phase as one team which has led to a remarkable development in the achievements of the federation’s programmes in most Asian countries,” said Darwish. He pointed out that the first big task this year was to see Qatar riders succeeding in qualifying for the 2020 Olympic Games in Tokyo. “It is not an easy task, but we are very confident in making the grade through the qualifying championship in Morocco in October with the participation of our top 24 riders,” he said. Darwish also informed that the QEF is also looking forward to organising an Asian Under-21 championship in Doha with the best riders from 13 countries.